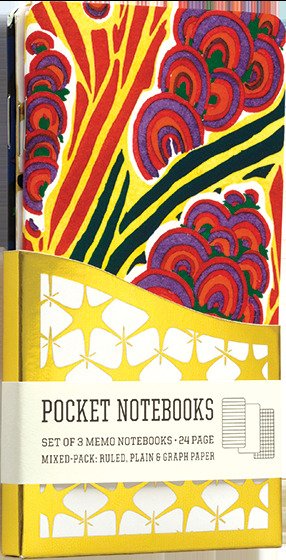 A Pack of 3 Memo Notebooks with Vintage Composition Book Designs. A number of the great French designers of the Art Nouveau and Art Deco period were apparently commissioned by the Parisian publisher A.Calavas to create designs for the use of wall paper, fabric and other manufacturers. These designs were printed by pochoir, a multi-stencil process using a huge range of brilliant and intense colors, in large portfolios. The designs on our Floreal set of small notebooks are taken from the set of that name, designed by Seguy. 3 pack of 24 -page memo books, in three styles, Graph, Ruled, and Plain, sleeved in Wallet Case.